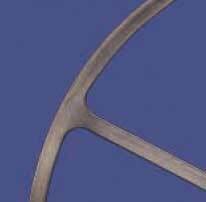 Gasket with a soft pliable core, surrounded by a metal jacket that totally or partially encloses the filler. Pass partition bars can be incorporated, either integrally or welded into the gasket. Jacket may be corrugated. • Autoclaves and other pressure vessels. Fillers – inert organic compounds, expanded graphite, Fluolion® PTFE, ceramic fibre. Jackets – soft iron, low carbon steels, stainless steels, nickel alloys, Monel, Inconel, aluminium, brass, copper, titanium. Material combinations may be selected to suit operating conditions.